Read this guide to find out what the 2018 UK threshold for inheritance tax is, how to increase your threshold, how to calculate your inheritance tax, the huge advantage of putting your life insurance into trust and just about everthing else you need to know about dastardly IHT! Inheritance Tax (IHT) is a tax owed to the government upon death. It can be seen as a tax that occurs on the estate of a person between their death and the beneficiaries receiving their inheritance. It can be quite a sizable sum, but there are various allowances and thresholds which make it a lot more bearable. The most important of these is the nil rate band (NRB) – which lists the threshold under which you pay no tax. The inheritance tax threshold for 2018 (NRB) is currently set at £325,000, and will remain so until a revision in 2021. If the estate is worth £325,000 or below, then the amount of IHT is nil. You also pay no inheritance tax when leaving everything to your spouse or civil partner or, additionally, if the entire estate is left to an exempt beneficiary – for example, a charity. In order to prevent people circumventing IHT by giving away assets in their twilight years, you must also include in estate calculations anything which has been given away in the seven years prior to death. Thus, a house which has been given (or sold for less than market value) to a family member or friend still counts when calculating the final estate value. A gift with reservation of benefit is something which has been given away (even prior to the seven year threshold) yet was still of benefit to the deceased up to their death. This might include a car that was given away, yet still driven by the deceased, or a house which was passed on to another but still lived in for less than market value of rent. These rules are in place to avoid fraud and evasion of inheritance tax. Although there are ways to avoid paying inheritance tax which you can read here. When determining the value of an estate, be sure to keep detailed records on its calculation and report it accurately. If the estate is valued at £325,000 or less (the NRB), your beneficiaries do not have to pay inheritance tax. This UK inheritance tax threshold covers a large majority of situations nationally. If the estate is passed to a spouse or civil partner, there is no need to pay inheritance tax. If the estate is passed to a charity or other exempt beneficiary, there is no IHT. Leaving your home to your children instead of your partner could be one way to avoid inheritance tax on property by raising the current inheritance tax threshold. As an additional threshold, the RNRB is an extra amount (currently £125,000) which is added on to the NRB if the home, or a share of it, is passed to children or grandchildren (which includes step-children, adopted children and foster children). This additional allowance is only relevant to the passing on of a home and doesn’t come into effect for other aspects of the estate. The RNRB is due to rise in accordance with the Consumer Price Index. For the 2019/20 tax year it will rise to £150,000 and the following year, £175,000. With the NRB and RNRB combined, the current (2018) tax free threshold for those inheriting a home from their parents or grandparents is £450,000. Inheritance tax is charged as 40% once the thresholds have been reached and accounted for. An estate worth £500,000 passed to a spread of family members will have a taxable amount of £175,000 (£500,000 minus the NRB of £325,000). 40% of £175,000 is £70,000. An estate worth £350,000 including the family home, passed to the children of the deceased will have a taxable amount of £0 (£350,000 comes under the NRB + RNRB threshold of £450,000). An estate worth £1,200,000 passed in full to the widow of the deceased will have a taxable amount of £0 (spouses are exempt from inheritance tax). An estate worth £1,000,000 including the family home worth £500,000 passed to the grandchildren of the deceased will have a total taxable amount of £550,000 (£1,000,000 minus the combined NRB/RNRB threshold of £450,000). 40% of £550,000 is £220,000. The executor of the will is in charge of arranging to pay the IHT. In situations where there is no will, the administrator of the estate will do this. 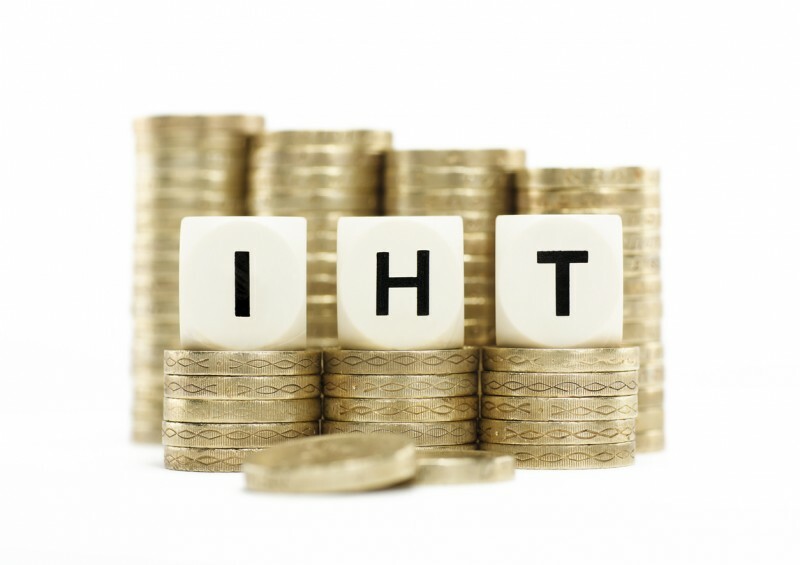 Normally, the IHT should be paid within the first six months after the death. After this time, HMRC will begin to add interest to the remaining total. It is possible to arrange an instalment plan with HMRC (for example, to avoid selling the home immediately to pay for taxes) but be aware that this will incur interest. Sometimes it can take a long period to properly calculate the value of the estate. If this is the case, and it is expected that IHT will be due, it is a good idea to have the executor pay off some of the tax before the six-month period to avoid interest. Money paid out of other accounts not held as part of the estate can be reclaimed from the estate once the value is fully calculated. HMRC will always refund any overpayments. The executor of the will does not usually distribute the remains of the estate to the heirs until IHT has been paid in full or any arrangement for a longer-term payment plan has been put in place. Life insurance policies can play a big part in IHT, as they can be set up to make a one-off payment, placed in trust, which covers the costs of inheritance tax. It is important that any life insurance policies designed with this in mind are placed in trust rather than being paid directly into the estate, otherwise they become part of the taxable estate value themselves! Using life insurance to pay IHT is an advised strategy for anyone who expects to leave a sizable estate for their family. If anything inherited provides a regular income (for example, rent from a property) then it will be subject in the future to income tax. Selling anything on and making a profit in the process could incur either income tax or, if the profit is substantial, capital gains tax. For more advice on inheritance tax, or to discuss the options available with life insurance policies to cover IHT for your family, contact our advisors today.